2000 square foot home is waiting for your leisure and comfort. Absorb the majestic views of Granite Mt. to the west - the front of the home. Admire the San Francisco Peaks & Mingus Mountains to the east - the back of the home. There are views to enjoy from every room! Guest bath has claw foot tub with shower. Master Bath features jetted garden tub plus separate over sized shower. There is a 3-Car over-sized garage for your convenience. The yard area is decomposed granite with a flagstone walk and accents. The covered back patio leads out from the dining room & master bedroom through French doors. The back guest bedroom exits to the back patio also. 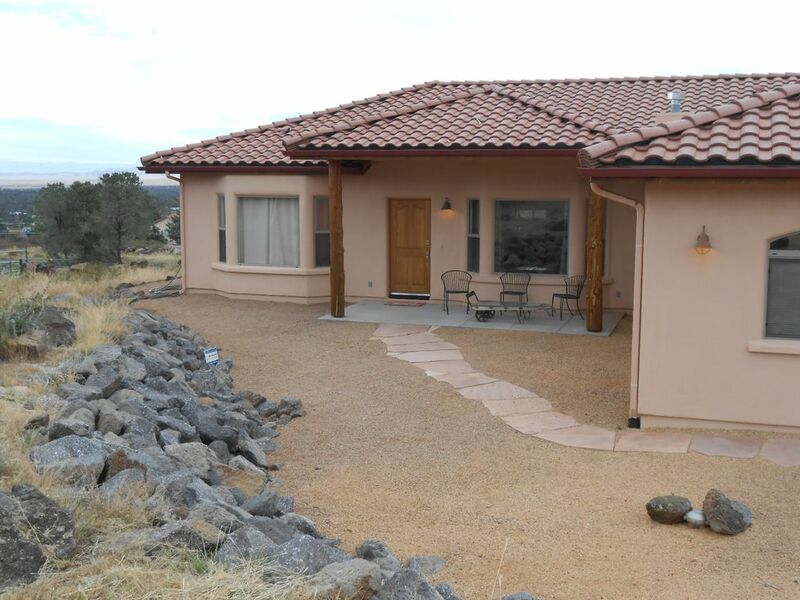 This home is close to all the amenities of Prescott, 'Everybody's Home Town'! So call, reserve & make yourself at home for a minimum of 3 nights, a week, a month....or even longer! You'll be glad you did! Email or call for additional info, pictures and directions. Master bath features bubbler tub, separate glassed-in shower with two shower heads, double sink vanity, and separate rooms for toilet and spacious walk-in closet with cedar shelving. Home purposely built to face Granite Mountain! Lovely mountain views in all directions! Double electric ovens; upper oven is convection. Both carafe & Keurig single serve coffee makers. Four-item bagel & bread toaster. Starter coffee & tea supplied, salt & pepper, basic spices. Service for 8 is provided with additional dishes stored in garage. Flat screen, wall-mounted televisions in each bedroom and great room. Wide range of genres. Take a book, leave a book. (2) Front area with decomposed granite & flagstone. Back partially covered cement patio. Has Self-Cleaning Double Oven. Gas grill stored in garage for convenience of outdoor cookouts! We stayed here for thanksgiving and had a blast! Homeowners were great everything you could possibly need they had! Nell was awesome as well!!!! We will definitely stay here again! Very clean home, owners are easy to work with and great location and views!!! We rented this property while waiting for a home to finish being built. The house is beautiful beyond words. The views are 360 and are amazing. The disappointment of not being in our own home was not a big deal because we enjoyed this one so much. Sitting outside for the sunset is remarkable! We had 4 vehicles and a trailer and the house was able to accommodate them all. Very peaceful and quiet. Greg and Marcia bent over backwards to make sure we were comfortable, they even moved their truck to allow us to park our truck!! Always responded quickly to any questions. We are so happy you enjoyed your stay in our home! We've always loved the location and have done everything we can to make our house "homey" and comfortable for our guests. Nice, comfortable home, great location. Friendly owners go out of their way to be accommodating. Thanks for your kind words! We are looking forward to having you back again next spring. We loved this beautiful house and its stunning views! The place was spacious, comfortable, immaculate, well-laid-out and quite tastefully decorated. The high ceilings gave it a luxurious feel while never detracting from the cozy atmosphere. We are a family of 4 and we stayed 6 days over the Thanksgiving 2014 weekend. We immediately felt at home and we were sorry to leave. There were several amenities, from the beautiful master bathroom to the very well-equipped kitchen. We cooked a big (i.e. 8+ courses) Thanksgiving dinner, largely from scratch. We found everything we needed, from great utensils, ample work surfaces and more appliances than we could use (newer and high-end ones). The owners, (and the lovely lady who gave us the key and showed us around) were very helpful with introductory details. Not a single issue of discomfort arose during our stay, yet we always felt we could reach out, had we needed to, as the owners were willing and accessible. We have stayed in many VRBOs in the last 8 years. We were thrilled with this place! We would definitely opt to stay here again. I was born in AZ but had not been back since I was a teenager, so my husband and I decided to make a road trip in the jeep. From Boise to Tucson in 12 days, with lots of fun stops in between. This was the first time we had been in a VRBO and weren't quite sure what to expect. We were soo thrilled with everything about this property.....from meeting the sweet lady in charge of handing off the keys to us, to the great location and gorgeous views. The open floor plan of this home makes it feel incredibly spacious, yet the décor and layout makes it cozy and very inviting. We had friends drive up from Phoenix and spend a night with us and we decided to stay at the house and BBQ instead of going out for dinner. They loved the house, too :) This property is equipped with everything you could possibly need and the location is central for all those outings that we took.....Grand Canyon, Jerome, Sedona, Prescott, Flagstaff! One of my top vacations ever! "road trip" and hope the little one enjoys the cowboy boots! Majestic views of Granite Mt. For the great outdoors...go to Granite Basin, Thumb Butte, Lynx Lake, Goldwater Lake, Watson Lake & National Forest great for outings! The Gateway Mall is convenient for those with shopping in mind!